Steam turbine Market size was valued over USD 28 billion in 2017 and the annual capacity is anticipated to exceed 120 GW by 2024. Regulatory measures to reduce carbon footprint along with increasing investments toward development of large-scale thermal power projects will drive the market size. Expansion of industrial infrastructure along with growing initiatives to mitigate the demand supply gap will further complement the industry growth. Resurgent economic growth along with regulatory norms to promote low emission fuels comprising natural gas and biomass will drive the steam turbine market share. Growing inclination toward energy optimization coupled with focus towards cogeneration will positively impact the business landscape. However, government initiatives to reduce dependency on coal-fired power generation, emission reduction norms and competitive cost of renewable technologies may hamper the industry growth. Impulse steam turbine market share is predicted to witness growth of over 2% by 2024. Compact size, low operational and maintenance cost are some of the paramount factors that will strengthen the product adoption. However, low efficiency when compared to reaction turbine makes them unsuitable for the large scale power generation. Ability to offer high efficiency when compared to impulse turbine coupled with increasing utility sector investments with an aim to limit electricity demand supply mismatch will drive the reaction steam turbine market share. However, complex designing, high cost and large footprint makes these systems unsuitable for small & medium scale applications. Ongoing investments toward new generating capacity additions to meet the ever rising electricity demand from industries will drive the condensing steam turbine market. Growing penetration of cogeneration systems coupled with rapid industrialization across developing economies are some of the other key underlying factors, which will boost the product demand. Non-condensing steam turbine market share is anticipated to witness growth over 1% by 2024. Ease of installation and its ability to withstand temperature fluctuations are some of the prominent factors that will drive the industry growth. These systems offer steam at a desired pressure which makes them suitable for processing industries. Biomass in 2017, accounted for over 4% of global market share. The growing efforts toward reducing carbon footprint coupled with supportive regulatory environment will enhance the industry outlook. Growing deployment of captive power generation and combined heat & power systems will further complement the business growth. 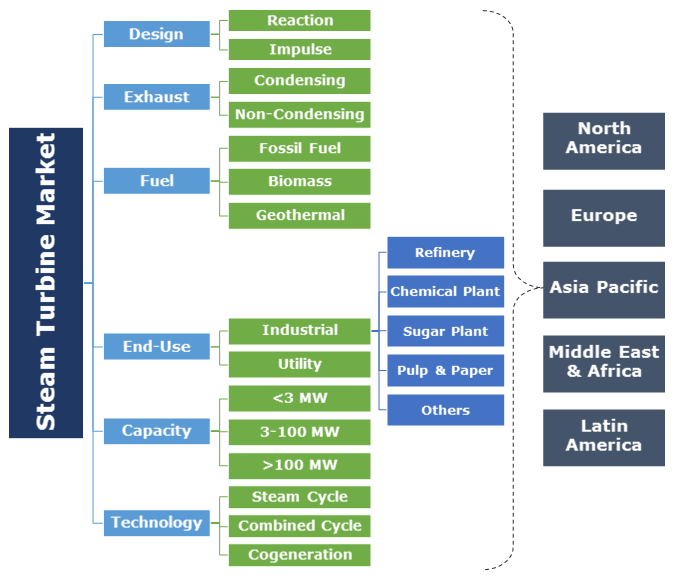 Steam turbine market share from geothermal in 2017, was valued over USD 400 million. Regulators have introduced various initiatives to encourage the adoption of non-conventional energy resources which will propel the product adoption. Its ability to provide reliable electricity with minimum carbon footprint has further stimulated the investment toward development of new geothermal capacity additions. Utility applications, in 2017, accounted for over 65% of the steam turbines market revenue share. Growing deployment of combined cycle technology along with increasing demand for onsite power generating systems will fuel the industry growth. However, replacement of coal-based power plants along with cancellation of a number of upcoming projects across India and China will hamper the business growth over forecast timeframe. Resurgent industrial sector growth post 2008 recession along with respective government efforts to boost domestic manufacturing will drive the industrial steam turbine market. These units are installed across heavy industries including refineries, chemical and sugar plants for electricity & steam generation. Rising investment toward development of new industrial centers will further favor the product adoption in coming year. > 100 MW steam turbine market, in 2017, was valued over USD 17 billion. Growing adoption of super-critical and ultra-super-critical technology coupled with the conversion of retiring power stations into combined cycle systems will foster the product deployment. Rapid industrialization, expansion of generating capacity and rising demand for captive power systems will fuel the business growth. Supportive government policies coupled with resurgent economic growth has resulted in robust expansion of medium-scale industries which in turn will fuel the 3-100 MW steam turbine market. Rising focus toward cogeneration and geothermal energy utilization along with efforts toward energy optimization will further complement the industry growth. 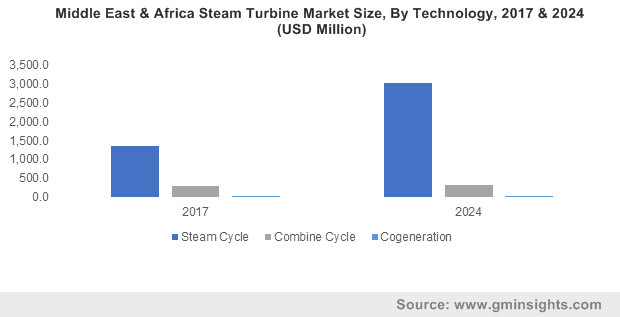 Steam turbine market by steam cycle is anticipated to witness stagnant growth on account of stringent emission norms along with regulatory measure to reduce dependence on fossil fuel power generation. However, growing installation of coal fired plants across South East Asian economies will stimulate the product adoption in the region. Cogeneration will witness robust growth on account of strengthening emission norms along with growing adoption of biomass based power generating systems. Rising demand for captive generation along with growing focus to improve energy efficiency are some of the major factors which will encourage the market growth. China market share is predicted to witness sluggish growth on account of stringent government measures to reduce GHG emissions from the key economic sectors. The Government of China has cancelled over 350 GW of thermal power capacity since 2010 as part of its strategy to diversify electricity generation mix. Positive investment scenario across renewable energy sector has further hampered the industry growth in the country. North America market is anticipated to witness growth of over 3% by 2024. Positive outlook toward the manufacturing sector in conjunction with growing penetration of combined cycle technologies for captive power generation will boost product demand. The increasing utilization of cogeneration technology across the region will further stimulate the business growth. Key industry players operating comprises Harbin Turbine, Siemens, Kawasaki Heavy Industries, Toshiba, General Electric, Eliott Group, Bharat Heavy Electricals Limited, Ansaldo Energia, Mitsubishi Hitachi Power Systems, Fuji Electric, Dongfang, Man Diesel & Turbo, Doosan Skoda Power, TurboTech and Mitsui. Eminent players across steam turbine industry are primarily focusing on various key strategic assets including product customization, inorganic growth ventures, development of innovative product range as part of their strategy. Furthermore, in addition to maintenance and upgradation, companies are also providing extended service portfolio to gain competitive advantage over other industry participants. Steam turbine is an electric power generator that are primarily deployed to produce electrical & mechanical energy from pressurized steam. Refinery, sugar plant, pulp & paper, chemical plants, are some of the key steam intensive industries where these units are installed. It is an assembled unit that consists of nozzles, fixed & moving blades, rotor, valves, seals, casing and other components.